The thesis of a unified and unequivocal ‘realism’ is both unruly and ultimately untenable. In this essay I will postulate that what we call realism is, in effect, a form of conditioning; one that is based on precedent and informed by conventionalised expectations. In order to set out a case for this, I will make use of various schemata, heuristics and theories of cognitive mapping, which I will place in opposition to a Bazinian paradigm, using two main films as textual examples. As David Bordwell outlines: ‘realism as a standard of value […] raises several problems. Notions of realism vary across cultures, over time and even among individuals. […] It is best then to examine the functions of mise-en-scene’ (Bordwell & Thompson, 2010). Realism thus, can best be understood as co-ordinates (mise-en-scene) by which we map out our own perception of actuality and plausibility, perhaps in accordance with a course predetermined by the director but not necessarily so. For Bazin, photography was unique in its objective nature. Indeed, much of today’s debates on realism are pre-eminently concerned with laments for a vanishing vision of the past, visions rendered by way of the photochemical index between light and stock. Certainly, the mechanical processes by which analogue images are created seems, at first glance, to hold more fidelity to the real by way of its dependence on a pre-existing condition that digital imaging does not require; however we are not spectators to the process of imaging but of the image itself, and ultimately the camera alone is not of the volition to decide where it points. The shot or the image is arranged, composed, often the mise-en-scene carefully selected and the persons (if any) meticulously blocked. The idea that an essential aspect of mimesis is lost by the lack of a physical index is fundamentally a sentimental argument, not a cogent one. Is realism ultimately diminished then, if the light intermediary is a sensor as opposed to a stock? This argument is a fickle one, which is why Bordwell’s counsel to use the mise-en-scene as the co-ordinates for realism is the more sagacious approach. What better way to analyse the realism of an image than by examining its most salient constituents and checking them against our own cognitive maps of veracity and our own heuristic understanding of what is possible or likely within the presented verisimilitude? The most often overlooked factor of reality is that we, as humans, have evolved such that we view the world in a way different than any other species, through a system of sounds, signs, symbols and sights; each of which carries with it a semiotic resonance. Humans view reality as a language. In cinema, this language is redoubled. Allegory, if we are to once again summon Bordwell, is the paradigm of textuality and the image is intrinsically polysemic (1989). If the image carries multiple meanings and multiple readings, our interpretation of the image, and of its realist quality, is based on our own conditioned viewing. In order to make sense of what is being presented, we rely on our previous experiences, using them as a template by which we map co-ordinates onto the film and can thus determine heuristically what is congruent and what is out of place, unfamiliar, or possibly even deceptive. 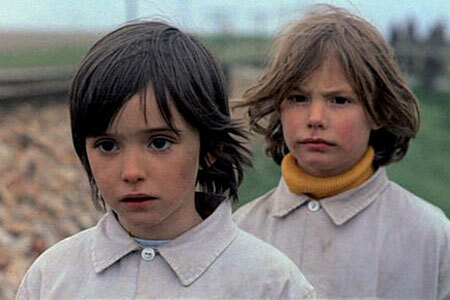 A good example of a film that deliberates this interlay, is Victor Erice’s 1973 piece El espíritu de la colmena ‘The Spirit of the Beehive’. Vicente Molina Foix remarked of El espíritu as ‘a study of the simulations of the real enacted by fiction onto the world’ (Foix & Smith, 1985). Through the protagonist’s dissociative fumblings between flesh and fantasy, Erice sets up El espíritu as a vehicle to explore the paradoxical notion of cinema as both mirror and window. El espíritu holds fast to many Lacanian theories, including the supposition that ‘truth is structured like fiction’ (Lacan, 1986). Indeed, El espíritu has all the contours of a fairy-tale, replete with the opening evocation of ‘once upon a time’. The fairy-tale schematic is one way in which the spectator can map this text and begin to delineate its corridors of realism. Ana (Ana Torrent), the film’s child protagonist draws immediate parallels with Little Red Riding Hood by way of her hooded cape attire. Indeed, Freud’s interpretation of the tale (Hood) was one of rebirth, a circumstance that could certainly be mapped onto Ana at the end of the film. Equally, the reading of Red Riding Hood as sexual parable is another viable set of co-ordinates by which to chart the film. ‘The darkness of her [Torrent’s] look work[s] as a veil, masking [….] 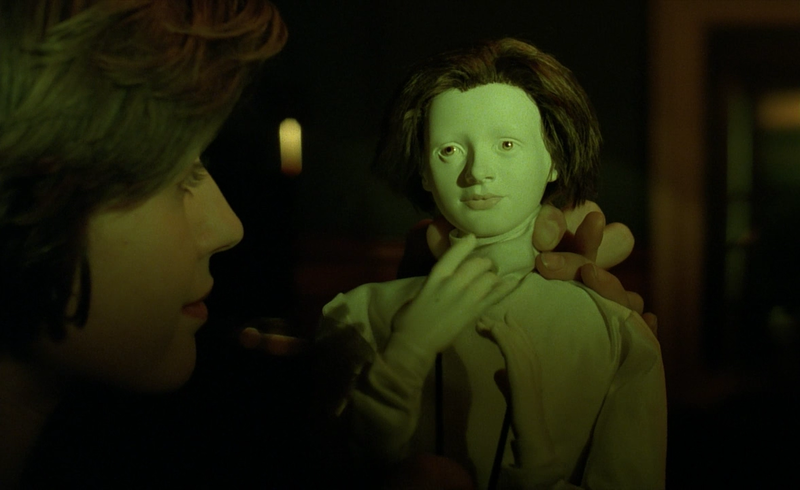 the disturbingly sexual resonances of the plot (in which a child gives herself to a monstrous man in the dark) (Smith, 1999). So it would seem, it is entirely possible to map realism by way of the fairy-tale schemata we inherit as children and carry with us as heuristic frameworks – as Lacan puts it, truth by fiction. Realism as both window and mirror is given voice in El espíritu. It references the different capacities of cinema as each, through visual metaphors, and what Bordwell defines as a ‘punning heuristic’ (1989). The first instance of this can be recalled ‘in one eloquent match shot […] the notion of windows as portals between the exterior and interior worlds of the protagonists is expressed in a shot of the window from outside that dissolves into a match shot of the window from inside without any movement of the frame’ (Stone, 2002). The second pun occurs as Ana wanders alone by the lakeside. In the water she sees her reflection (a pun on the Lacanian postulation of the ‘mirror stage’ in a process of self-identification), though her reflection quickly dissipates, and in its place the face of Ana’s locus of misrecognition, Frankenstein, appears. Mirror quickly becomes window, illustrating a dialectic between historical realism and phenomenological realism. For Bazin, historical realism was paramount. Cinema’s prevailing concern was to seize time itself and render it in a dynamic monument of moments captured. The trouble with this dialectic, is that it is contingent on retrospection. Historical realism is simply phenomenological realism shot through by time’s arrow. Phenomenological realism is all we know, but as perspectives grow older they seem to gain credence, they become precedent, they become signposts, symbols that mediate our language and decide how we interpret present tangibles. It is these signs and symbols that mediate Ana’s journey to comprehending differences in the language of reality and fantasy. As children, we are strangers in an adult world, never distinctly aware of its meanings or nuances; innocence, a unique cornea that lets us walk unencumbered by its facts until slowly time beats it away and we are left to watch a world of intrinsic human complication unfold and draw towards us like a new age. What we witness in El espíritu, is very much the reality of a child’s perception, as the walls cave in and the divide that had nurtured our inchoate selves is stripped away and we begin to learn the signposts of an adult world, though we at first confuse them. The semiotic resonance of the train scenes that punctuate the film point to this departure, and locomotion becomes symbolic of the incipient proprioception between flesh and fantasy. The most noteworthy reminder of this being as Ana puts her ear to the railway tracks to hear the disembodied rumblings of the train, only for her judgement between real and imagined to lapse, and for her to forget momentarily the danger the iron horse poses to her. Upon viewing James Whale’s Frankenstein (1939), Ana is exposed to a new language, a new discourse – that of cinema. Ana fails to comprehend the inherent difference in discourse, thus the screen as both window and mirror become permeable and Ana is left without a concrete external referent. The grey matter that thus subsumes the screen points to the Lacanian real. In this, the “primal moment” of Erice’s opus, the axis of Ana’s gaze is shifted and she is now ‘looking awry’ at an unmediated world of real and imagined, where reality is both mirror and window. ‘Far from being a sign of madness, the barrier separating the real from reality is therefore the very condition of normalcy’ (Žižek). In order to delineate this grey matter, Ana must learn to structure the world through language, thereby constituting a border between actuality and invention. The film charts the journey Ana undertakes to assert this border. El espíritu’s final scene depicts this journey’s conclusion. There is a symbolic opening of the doors and a crossing of the threshold onto an outside balcony, where ‘external reality’ is allowed to strike Ana ‘with all its material presence’ (Žižek). The recurrence of disembodied train noise affirms this departure once more, and points by way of its circularity to a return to a material referent. Ana’s final monologue recalls the Lacanian theory of identification, as she is now able to make distinctions that allow her to place herself concretely within reality. It is through language, that Ana is able to affirm a developed proprioception between fantasy and reality. “Soy Ana” – I am Ana. 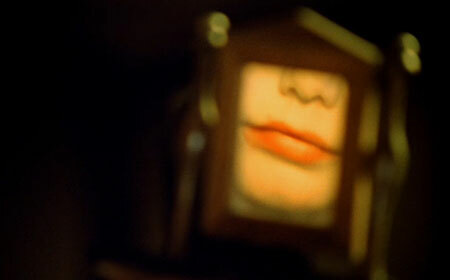 In The Double Life of Veronique (1991), the Bazinian paradigm of realism is, once more, subverted. 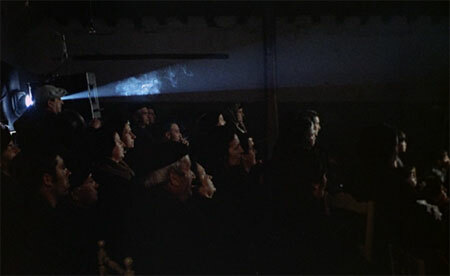 The stylized colouring of the film, most probably through filters, is in opposition to Bazin’s notion that manipulation of the image is abhorrent. Furthermore, it conflates the idea of an objective realism through its use of dual protagonists and the use of colour. The world is coloured differently for each incarnation of Veronique (Irène Jacob), thus pointing to a subjective realism and language differential. Like El espíritu, Double Life’s realism can be heuristically determined by language structures. As is done for El espíritu, we can break Double Life down into mythemes and trace a mythic operator (Smith). Double Life takes a literal interpretation of the theory of a ‘strange attractor’. The strange attractor in all cases is the sudden feeling of kinship and reciprocity between two people who have yet to meet. This is true of the relationship between both iterations of Veronique, and of the latter’s relationship with Alexandre (Philippe Volter). In terms of realism, the principle of strange attractor is a schematic by which we can map this text. ‘It is possible for a system to behave in a “chaotic”, irregular way, i.e. never to return to a previous state [realism by precedent] and still be capable of formalisation by means of an “attractor” that regulates it – an attractor that is “strange”, i.e. that acquires the form not of a point or of a symmetrical figure, but endlessly intertwined serpentines within the contours of a definite figure, an anamorphotically disfigured circle’ (Žižek). Realism as a cinematic term is, perhaps, a misnomer. By cinema’s very nature it is projection, and what is projection if not wrought with desire and fantasy? Realism without language, without being symbolically mediated, is inert. Without a form of interpretation (usually based on precedent) reality cannot be registered, and since interpretation is an entirely subjective enterprise, Bazin’s notion of an objective realism exists only as a pre-symbolic space inaccessible by human vision or by the mechanical operations of the camera. Unified and unequivocal realism is thus untenable and polysemy is the name of the game. The image has multiple readings and multiple meanings, we must look for congruency. Our search in this regard, is aided by the co-ordinates of mise-en-scene, our own experiences of reality and a heuristic understanding of what is likely to happen next. Objective realism, that which has no allegiance to ideology, is (perhaps at the pinnacle of irony) ultimately fantasy – an imagined space. Bazin, A. & Gray, H., 1960. The Ontology of the Photographic Image. Film Quarterly, 13(4), pp. 4-9. Bordwell, D., 1989. Making Meaning: Inference and Rhetoric in the Interpertation of Cinema. Cambridge, MA: Harvard University Press. Bordwell, D. & Thompson, K., 2010. Film Art: An Introduction. 9th ed. New York: McGraw-Hill. Darke, C., 2010. “Les Enfants et Les Cinéphiles”: The Moment of Epiphany in The Spirit of the Beehive. Cinema Journal, 49(2 Winter), pp. 152-58. Foix, V. M. & Smith, P. J., 1985. La guerra detrás de la ventana. Revista de occidente, Issue October, pp. 112-18. Lacan, J., 1986. The Ethics of Psychoanalysis 1959-1960. In: J. Miller, ed. The Seminar of Jacques Lacan Book VII. London: Tavistok/Routledge. Smith, P. J., 1999. Between Metaphysics and Scientism: Rehistoricizing Victor Erice’s El Espiritu De La Colmena (1973). In: P. W. Evans, ed. Spanish Cinema: The Auteurist Tradition. Oxford: OUP, pp. 93-114. Stone, R., 2002. Spirits and Secrets: Four Films about Childhood. In: Spanish Cinema. New York: Longman, pp. 85-94. The Double Life of Véronique. 1991. [Film] Directed by Krzysztof Kieslowski. France/Poland/Norway: Sidéral Productions. The Spirit of the Beehive. 1973. 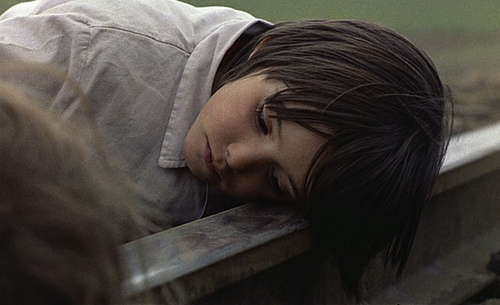 [Film] Directed by Victor Erice. Spain: Bocaccio Distribución S.A..
Žižek, S., 1991. Looking Awry: An Introduction to Jacques Lacan through Popular Culture. Cambridge, MA: MIT Press. Analogue photography is traditionally dependent on ambient light. Digital cameras on the other hand, are facile in their ability to use a digital light gain or simply increase the ISO (stock required various emulsions for that).